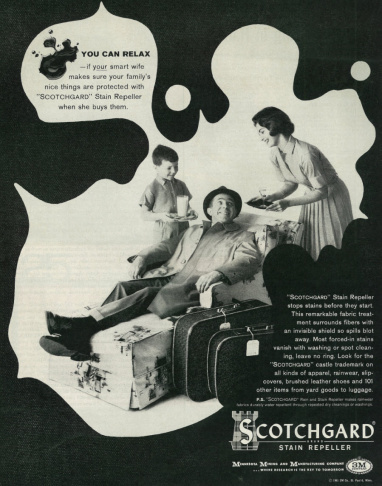 A 1961 ad for 3M's stain-repeller, Scotchgard, which contained PFASs. 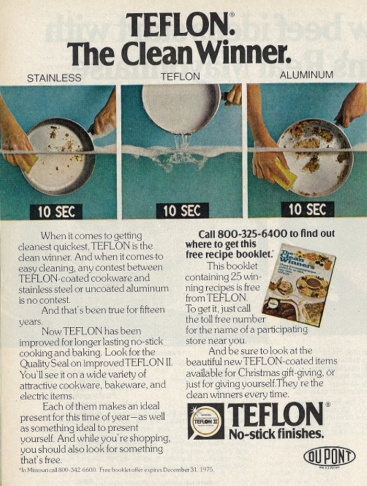 A 1975 ad for DuPont's Teflon, which contained PFASs. When the Environmental Protection Agency created new health limits for two hazardous chemicals, five Southern California water agencies instantly had water quality problems on their hands. The cities of Pico Rivera, Anaheim, Orange and Corona and the Eastern Municipal Water District detected high concentrations of perfluorooctanoic acid (PFOA) and perfluorooctane sulfonate (PFOS), known collectively as PFASs. They are five of 66 public water agencies nationwide, serving six million people, that had at least one sample of PFASs at or above EPA’s new public health advisory limit for the chemicals, according to a new Harvard University and UC Berkeley study analyzing EPA monitoring data. “The health advisory was only announced in May. 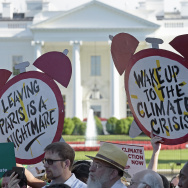 So everybody’s scrambling to deal with it,” said Arlene Blum, head of the Green Science Policy Institute at UC Berkeley and a co-author of the paper. PFASs take years to break down once in the environment or inside human bodies, and are associated with high cholesterol, decreased efficacy of vaccines and certain cancers, among other ailments. Some home water filtration systems may remove the chemicals, but there’s little research on which ones or how often the filter must be changed for it to be effective. Prior to 2015, PFASs were commonly used to make grease and water resistant coatings for clothing, furniture and paper packaging like pizza boxes and popcorn bags. It was also used in firefighting foam at military bases and airports. The DuPont chemical company used PFOSs in Teflon, and 3M used them in Scotchgard. In 2006, the EPA asked these companies and others to voluntarily stop making the chemicals by 2015. In May, the EPA created a new limit for PFASs in drinking water of 70 parts per trillion – down from the previous limit of 400 ppt. The new standard reflects the safe limit for a lifetime of exposure to the chemicals versus short-term exposure, which is what the previous standard reflected. The new limit is currently only advisory and is not enforceable. Instead, it’s up to individual water agencies to decide what to do if they detect PFAS concentrations of above 70 ppt in their water supply. KPCC spoke with representatives from four of the five local agencies cited as having exceeded the new standard -- Anaheim, Orange, Corona and the Eastern Municipal Water District. They said they have taken the sources of their PFAS-tainted water offline. In most cases, those sources remain offline. The agencies also said they blend their water from multiple sources, which means even if one source had high levels of PFAS, water delivered to customers contains a much lower percentage of that water because of the blend. The City of Anaheim had two groundwater wells with PFAS concentrations above the EPA’s health advisory limit, according to EPA data. City officials took the wells offline immediately in May and decided to take new water quality samples, which they sent to an independent laboratory to process, said Michael Moore, the assistant general manger at Anaheim Public Utilities. The test results revealed the concentrations of PFAS were actually below 70 ppt, so Anaheim is now turning the wells back on. Moore said he doesn’t know the source of the pollution. Anaheim has 17 groundwater wells, which produce two-thirds of the city’s total water supply. The rest is imported. The City of Corona took three wells out of service in May upon realizing they were above EPA’s new advisory limit. Jonathan Daly, general manager of Corona’s Department of Water and Power, said the wells were “a small percentage of overall water supply.” The wells are still offline while the city studies how to best treat the water. Daly said he’s not sure where the pollution came from. There is no military base or chemical manufacturing plant near by. Corona gets about half of its water from groundwater and the rest is imported. Eastern, which provides water to over half a million people in Riverside County, detected high levels of PFAS in one groundwater well. It immediately took the well offline and identified the source of the pollution: the March Air Reserve Base. The water agency is working with the Department of Defense to clean up the groundwater and bring the well back online. EMWD spokesman Kevin Pearson said the agency draws water from 18 groundwater wells, so the affected well was a very small percentage of the total water supply. Fresh groundwater provides 10 percent of EWMD’s total water, recycled water 35 percent, imported water 50 percent and desalinated groundwater five percent. The City of Orange detected high levels of PFAS in two of its 16 groundwater wells. Those wells are now offline. According to the city’s website, between 66 and 80 percent of Orange’s water comes from groundwater; the rest is imported. The City of Pico Rivera’s water department did not return calls requesting comment. Shutting off groundwater wells and blending water from multiple sources is a good way to deal with the problem, said Michael Focazio, who works in the toxic substances hydrology program for the US Geological Survey. He was not involved with the Harvard-Berkeley study. Focazio pointed out that water agencies aren’t legally obligated to do anything about high levels of PFASs—after all, the EPA’s new health advisory limits are just that: advisories that are not enforceable. He said PFASs will remain in the category of being monitored but not regulated while EPA gathers data on the chemicals' extent in drinking water in the US. 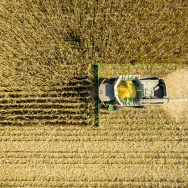 Then the agency will weigh the costs versus health benefits of creating an actual drinking water regulation for the chemical and decide if it wants to proceed with regulation.